Today (27 November 2018) the Supreme Court has decided not to grant permission to Noel Conway to bring his case to a full hearing at the Supreme Court. Noel Conway’s case will proceed no further. The permissions hearing took place before Supreme Court President Baroness Hale of Richmond, Deputy President Lord Reed and Justice Lord Kerr of Tonaghmore. In their decision the Supreme Court Justices make clear the importance of the issues raised by the case for society “No-one doubts that this issue is of transcendent public importance”. The decision also confirms that “the ban on assisted suicide is an interference with the right to respect for private life protected by article 8” [the right to private life]. 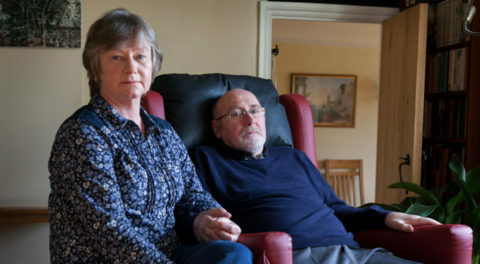 Noel Conway, 68, from Shropshire, has terminal motor neurone disease and brought a judicial review challenging the current law on assisted dying. Noel feels that he is prevented from exercising his right to choice and control over his death under the current law and he fears that without a change in the law he may be forced to suffer against his wishes. Noel, supported by Dignity in Dying, has instructed law firm Irwin Mitchell to bring this case to fight for his right to have the option of an assisted death when he is in his final six months of life. Noel said, “Today’s decision is extremely disappointing. It means that I will not be able to have my arguments heard by the highest court in the land. Dying people like me cannot wait years for another case to be heard. “I am particularly disappointed that the Courts have instead listened to the arguments of doctors who have never met me but think they know best about the end of my life. I have no choice over whether I die; my illness means I will die anyway. The only option I currently have is to remove my ventilator and effectively suffocate to death under sedation. To me this is not acceptable, and for many other dying people this choice is not available at all. Sarah Wootton, Chief Executive of Dignity in Dying, said: “This decision is a grave injustice for dying people across the country who want to have a say in how and when they die. Despite the Supreme Court saying in 2014 that the current law on assisted dying could be in breach of dying people’s human rights, MPs failed to address these issues in 2015. After opening the door with its judgment in the Nicklinson case, The Supreme Court has declined to follow through, which will come as a bitter blow to those who want control over the manner and timing of their deaths. “Not only does today’s decision let down dying people, it lets Parliament off the hook. When more than 80% of the British public want to see a change in the law on assisted dying, and when countries like the USA, Canada and Australia can all craft compassionate, safe laws to allow their citizens this choice, we must ask why the UK is being left behind. Our current laws on assisted dying are outdated, unclear and unsafe. They allow assisted dying for those who can afford it or who are well enough to travel to Switzerland, but deny choice to the many more who want to die in their own homes, with their friends and family around them. For interviews with representatives of Irwin Mitchell, please contact pressoffice@irwinmitchell.com / 0114 274 4666. Noel Conway, 68, from Shropshire, was diagnosed with amyotrophic lateral sclerosis (ALS), a form of motor neurone disease, in November 2014. His condition is incurable and terminal. Noel feels that he is prevented from exercising his right to choice and control over his death under the current law. He fears that without a change in the law he may be forced to suffer against his wishes. Noel is bringing this case against the Secretary of State for Justice to fight for his right to have the option of an assisted death when he is in his final six months of life. Dignity in Dying is supporting Noel’s case. The Noel Conway v Secretary of State for Justice case was heard at the High Court on 17-20 July 2017. A written judgment was handed down in 5 October 2017, rejecting the judicial review claim. Mr Conway and his legal team were granted permission to appeal this decision on 18 January 2018, and a hearing took place at the Court of Appeal on 1-3 May 2018. A judgment was handed down on 27 June 2018 rejecting the case. Mr Conway and his legal team applied to the Supreme Court to appeal this decision, and a permissions hearing took place on 22 November 2018. The appeal was rejected on 27 November 2018, meaning his case will proceed no further. In July 2018 the Legislative Assembly of the Falkland Islands voted to support a motion that terminally ill residents should have the right to die at a time and place of their choosing, subject to robust legislation and safeguards. A second motion stated that should assisted dying legislation be introduced in the UK, the Falkland Islands would consider adopting it. Hawaii became the seventh American state to legalise assisted dying for terminally ill people in April 2018. It follows Colorado, California, Montana, Vermont, Washington and Oregon (which first introduced their End of Life Options Act in 1997). An assisted dying Bill also passed in Washington, D.C. in 2017. Victoria became the first Australian state to pass a Bill legalising assisted dying for terminally ill people in November 2017. A similar Bill was defeated in New South Wales, Australia, by only one vote in November 2017. Irwin Mitchell is over 100 years old and is one of the largest law firms in the UK. Last year Irwin Mitchell merged with Thomas Eggar LLP expanding its presence in London and the South East and has also acquired specialist Personal Injury firm MPH Solicitors and private wealth firm Berkeley Law in the past few years. For more information, visit www.irwinmitchell.com.